Then Whitewater Equestrian Center has a treat for you! 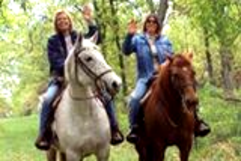 Become one with nature as you make your way on horseback through a variety of private trails. Experience a bit of history on both Native American trails and historic logging roads. On the wilderness trail in the North American rain forest, one of only two in the United States, the other in the State of Washington, you’ll have the opportunity to learn about the animal and plant life, as well as some local history. You may pass by John Green's grave, a famous local legend, and learn about his very interesting demise. All trail rides are great for beginner through advanced riders, with beautiful wooded scenery and mountain streams. Our well-trained horses will give you a fantastic ride. We strive to meet the needs of all our riders. Due to the terrain of the rain forest, our guided trail rides are at a walking pace. If you're shy about riding horseback, you can stay behind at the barn and partake in gem mining. We have small buckets or large buckets and each contains about 20 polished gems ready to make jewelry. You can also go online and research your gems to find our their origin and type. Or if you'd rather just relax in the seating area and take in the fresh air and take in some of Mr. Hinkle's famous Indian stories, you're always welcome to do so. Don't forget to swing through our gift shop and purchase a t-shirt or other trinkets. The gift shop is located to the right of the main office, through the sliding glass door. We welcome you to take photos of our various pets on the farm as well! Are you looking for an adventure on horseback? You'll sit high in the saddle on one of the many kind-natured horses from Whitewater's stock. The gem mine will peak your interest in gemology. Don't just see Western North Carolina. Experience it!